Looking for the perfect present that's sure to please any wine aficionado's refined taste? World-renowned for their high-quality wine accessories and stylish takes on classic designs, Wine Enthusiast has been enchanting the wine lover community for nearly 40 years. Nothing short of a masterpiece, the Vivid Wine Decanter is hand-crafted in Eastern Europe by experienced glass blowers. 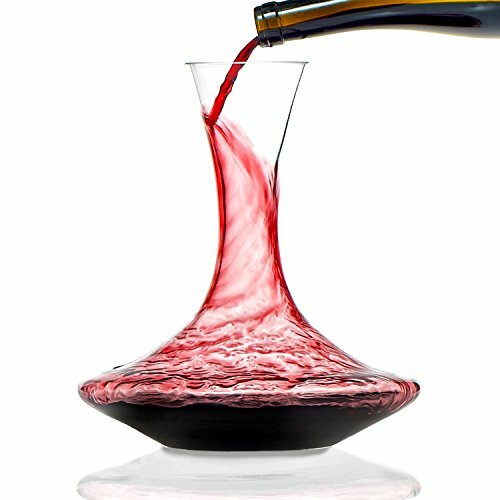 Even the pickiest wine connoisseurs will be impressed with the quality and craftsmanship of the Vivid Decanter As Durable as it is Beautiful. Don't be fooled by cheap mass-produced imitations. This slender carafe may look dainty, yet it's formed with a thick wall of high-quality lead-free crystal glass. Holding up to a full 47 oz (nearly 2 bottles) of wine, the durable wide-based design of the decanter maximizes the breathable surface area. An ergonomic neck and spout allows you to effortless decant and pour an entire 750 ml bottle of wine. Place it as a tabletop centerpieces while not in use, or simply display it as a work of art. Open up your wine and let it breathe. The large surface area allows for easier oxygenation wine to fully aerate for a more expressive aromatic flavor and smoother finish. Keep your wine carafe sparkling by hand washing it with soapy water or glass cleaning liquid and reusable cleaning beads or brush. It can be air dried on a stand or using a decanter dryer for best results. Measures 9.25" in height. IDEAL FOR GIFTING - Handmade in Europe, the sleek classic design of the Vivid Wine Decanter by Wine Enthusiast is both stylish and refined; making it the perfect way to indulge your favorite wine connoisseur. LARGE CAPACITY - Holds up to a full 47 oz (nearly 2 bottles) of wine, the durable wide-based design of the decanter maximizes the breathable surface area. An ergonomic neck and spout allows you to effortless decant and pour an entire 750 ml bottle of wine. ENHANCES FLAVOR - Let your wine open and breath. The large surface area allows for easier oxygenation; allowing the wine to fully aerate for a more expressive aromatic flavor and smoother finish. ELEGANT CENTERPIECE - Don't be fooled by cheap mass-produced imitations. Formed with a thick wall of high-quality mouth-blown lead-free crystal glass the Vivid decanter is nothing short of a masterpiece. Place it as a tabletop centerpieces or simply display it as a work of art. MAINTENANCE - Keep your wine carafe sparkling by hand washing with soap and water and air drying. Measures 9.25" tall.